Balenciaga – The seats may have collapsed before the show and the guests may have had to stand, but once the collection hit the runway it didn’t seem to matter. Nicolas Ghesquiére (Creative Director) sent out unusual shapes with a new silhouette. Couture techniques and denim pants. What more could you want? 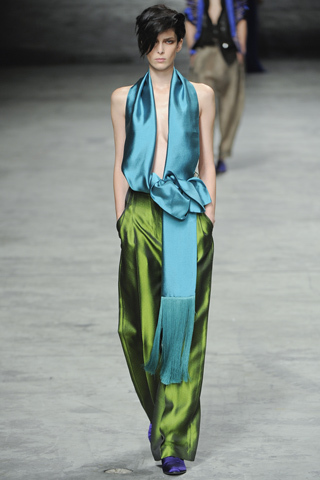 Haider Ackermann – The new kid on the block proved at his show this season that he knows how to rock a colour palette. Every colour in the rainbow and beyond were present as the models moved slowly and swiftly down the runway. I have big hopes for this designer….very big hopes. Chanel – For Fall we were among the rocks and soils as models floated down the graveled runway in a colour palette consisting of mostly grey and black. This season we dug even deeper through the rock and soil, reaching the magical mystery of underwater. Karl Lagerfeld created contrast with a colour palette of white and cream compared to last seasons grey and black. A light and refreshing collection for Spring. To top it all off, Florence Welch appeared out of a sea pearl to debut her new song. Alexander McQueen – A lot of pressure was on Sarah Burton this season. It is the collection after the Royal Wedding dress. Did she impress? Oh yes indeed! Burton, like Chanel, had an underwater vibe to it. The range of sea creatures expanded as more and more shapes started to appear. Bravo Sarah, you have done it right again. Louis Vuitton – Marc Jacobs always has a way to shock the crowd. As guests took their seats facing the plain white runway, the center lifted up to reveal a caraousel with each model on white wooden horses. The crowds reaction set the exciting atmosphere. A collection of pastels, peplums,feathers, and the amazing Kate Moss made it’s way around the rotating carousel. What will Marc do next?